Womb Pulsing is an ancient indigenous technique that was practiced in women huts around the world for thousands of years. Presently, this relaxing healing work has been adapted to suit our modern lifestyles and is an accessible process for everyone. Womb Pulsing is a physical technique. It requires two people. One person lay on their back while the other sits on their abdomen, womb or hara area. The hara is 3 finger widths below the navel. The person on top will begin to bounce up and down to the rhythm of music while the person on bottom release through deep breathing. In doing so, stagnate energies stored deep within the womb begins spiraling upward, so that it can be released. This movement helps release energies from past sexual relationships, emotional trauma, energy imprints, clearing of ancestral baggage and remove stagnate life force. Emotional Suffering and psychological problems are manifestations of bio-electrical blockages in the nervous system. Connecting vital points on the bone structure, feeling the pulse beat, and the use of sound vibration, stimulates a positive electrical current to flow throughout the womb which is closely connected to the nervous system, discharging areas of pain and suffering. The womb is the center of every woman's life . It is the place that holds all emotions, feelings and intuition. It is the core. Our core is connected to the center of our galaxy. The place where all energy resides before manifesting on a physical level. As women grow throughout life from birth to adulthood, all experiences encountered as shocking, hurtful and abusive is stored within the womb causing blockages along the nervous system of the body, creating specific behavior patterns which can lead to the development of disease. In this society most women are not taught how to clear out emotional baggage from trauma, abuse, day-to-day toxic emotional experiences and ancestral lineage energies. If we embrace our emotions with each experience that we have, we can feel through the process without suppressing our feelings. Allowing what we feel to pass through our bodies and not store them. We can pick and choose what we want to store. Not all things need to be stored. When we suppress our feeling we then begin to store unwanted energies deep within our womb. 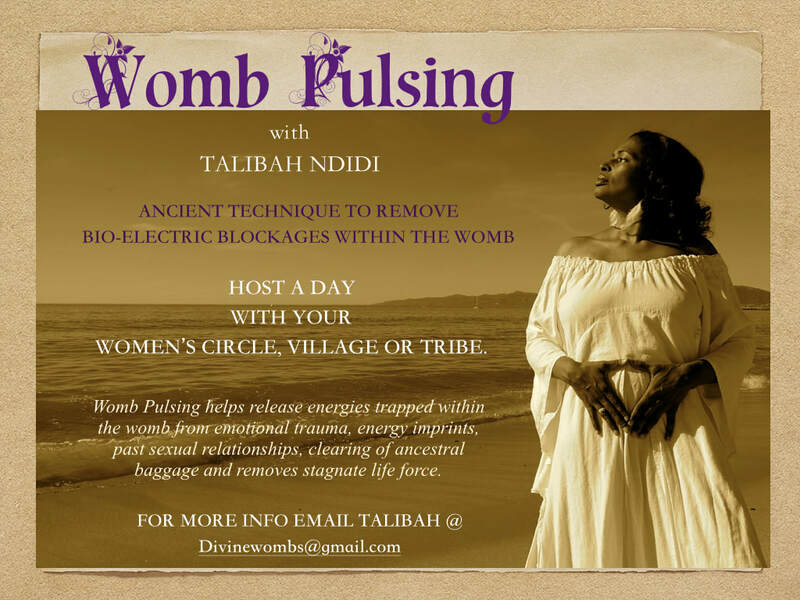 Host a Womb Pulsing Session with Your Goddess Circle or Tribe! Your lovely soul, an open heart. Blanket and small pillows for cushions on knees. *Womb Pulsing is a physical technique and will require bending of the knees. There is an alternate position for those with knee problems.